The Royal Challengers Bangalore got a very special visitor in training on Tuesday. 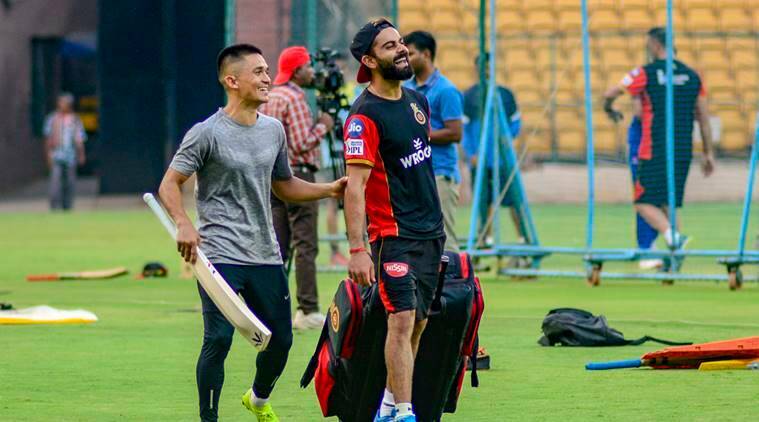 Bengaluru FC and India captain Sunil Chhetri was pictured with Virat Kohli and the RCB squad at the Chinnaswamy stadium. Chhetri is fresh off winning the Indian Super League with Bengaluru FC, his sixth title with the club. His team beat FC Goa, a franchise co-owned by Kohli, in a hard-fought final 1-0 to lift the trophy. While Chhetri’s Bengaluru FC are done with their league season, RCB are just getting started. Their first match of the upcoming 2019 IPL is the season-opener against defending champions Chennai Super Kings. RCB was one of many who congratulated Bengaluru FC for their victory on Twitter. The club entered the ISL only last season. While they topped the league table on debut, a loss in the final against Chennaiyin FC undid their efforts. It meant that the club, who had reached the final of the continental AFC Cup tournament in 2016, had to spend a year outside Asia tournaments. Virat Kohli will be hoping that RCB can break their duck this season. Despite possessing star-studded lineups over the years, RCB have failed to win the title even once in the 12 years of its existence.